You may not want to talk about Christmas yet, but people are getting ready. Choirs are practising their harmonies and sugar plum fairies are trying out their tutus. And in a foil wrapped package in my cupboard, my favourite Christmas sweet is softening and ripening. Vinarterta is best aged for 3 weeks, so I cracked open the Christmas baking this week when I had a few days off. It’s a layer cake made of cardamom flavoured dough pressed into cake pans and brought together with a prune jam flavoured with cinnamon and vanilla. 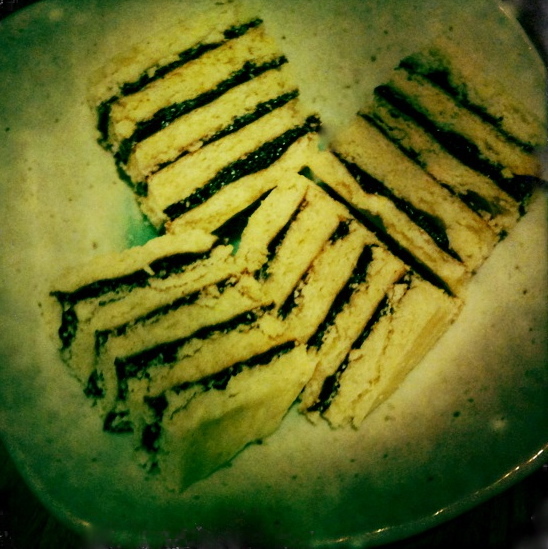 Once aged, the cake is soft enough to slice into tiny squares like a fruit cake. It adds beautiful stripes to your Christmas baking plate. It’s one of my very favourite things to eat. This recipe came into my family in the 1960’s somewhere on the chilly plain of Sakatchewan from a church-going woman of Icelandic descent. My family is not Icelandic but smart enough to know a great recipe and so my grandmother baked it, and after her my mother and now it’s a bit of a family tradition. This cake is now quintessentially Icelandic-Canadian which is a fairly specific origin. It’s enough of a story that someone wrote a PhD dissertation on it. The spice profile of Vinarterta is subtle and unusual. You pop a little slice in your mouth and think: mmm, what is that? This is my ideal use of spice, where it adds a tasty je ne sais quoi that eludes to another place but doesn’t smack you over the head with it. It’s too subtle for Brock whose favourite Christmas sweet is mince tarts which I find completely overpowering. Vinarterta is a contralto to the boisterous soprano of mince tarts. When I was a kid, making Vinarterta involved stewing prunes to soften them, pitting them, then running them through a meat grinder clamped onto the kitchen table. I was a kid, so I’m sure I was totally useless in this process but I thought it was neat. 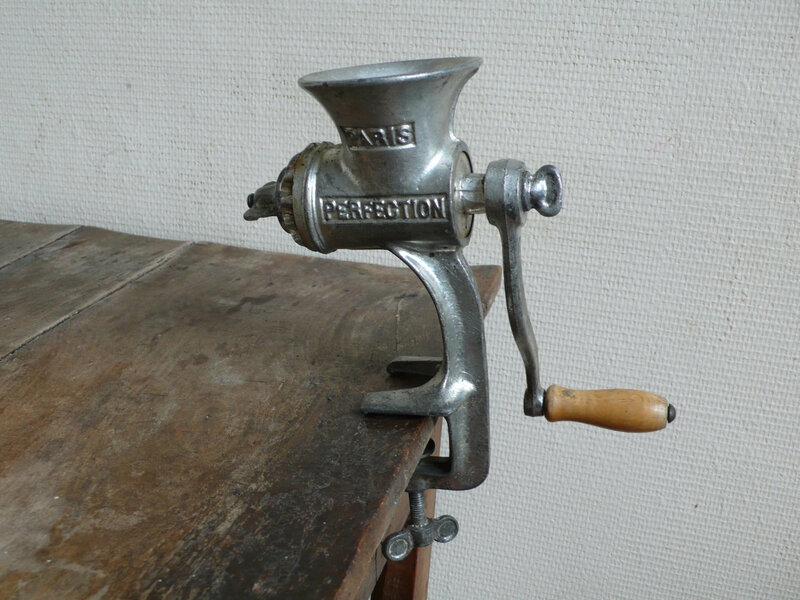 It was the only use we had for the meat grinder. Nowadays I buy pitted prunes and zip them up in the food processor. It makes Vinarterta fairly manageable as Christmas baking goes. Let’s talk about the name Vinarterta. That’s apparently the correct spelling, which seems like the most awkward possible, (proof that it’s right if you’ve even seen any other Icelandic words.) My copied out recipe card reads “Vinartarta” and my family pronounces it “Vinatarta”. The Icelandic word apparently means Viennese cake. It seems like a small miracle that this worldly, wandering little cake has found a home in my recipe box and family Christmas repertoire. I feel lucky to know it. I treasure it. I’m grateful for the Icelandic woman who shared her special recipe. I’m thankful for the women who came before me, bravely pitting and grinding prunes, up to their hips in children. Recipe note: My mum who hasn’t eaten wheat since the 90’s has made this with spelt flour and rice flour. It works beautifully with both although tends to be a touch more crumbly. Also, apparently I can’t read my own recipe because this year I made 4 cakes instead of 5 – oops. Many traditional recipes call for 6 or 7 cakes. This recipe made with 5 cakes is tried and true. Preheat the oven to 375F. Prep 2 or more 9″ cake or springform pans with parchment covering the bottom. Cream the butter and sugar then add the eggs & cream, then dry ingredients. Divide the dough into 5 equal parts. I use my scale here but you could just eyeball it. 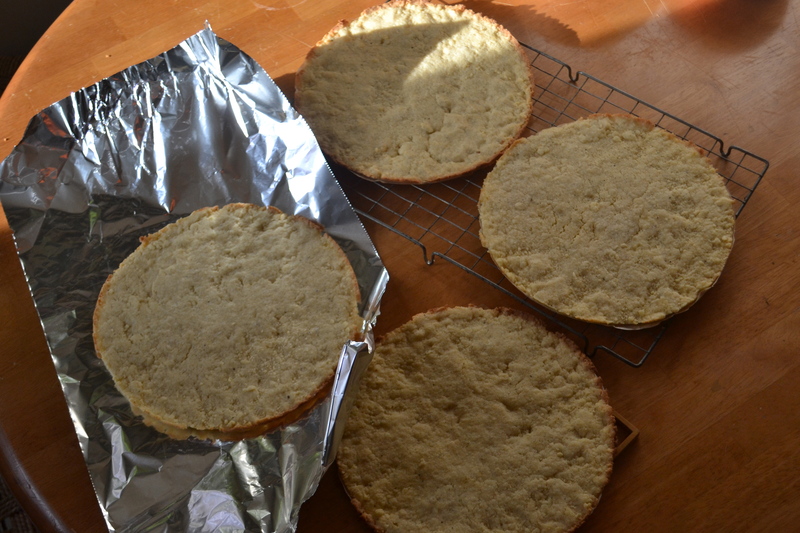 Press each ball of dough into the cake pan and bake 10-15 minutes until slightly golden. Remove from tin while hot & cool. They will harden. Combine add the filling ingredients in a food process and run until smooth. Transfer to a pot and cook over medium heat until it comes to a gentle boil (no need to cook further). 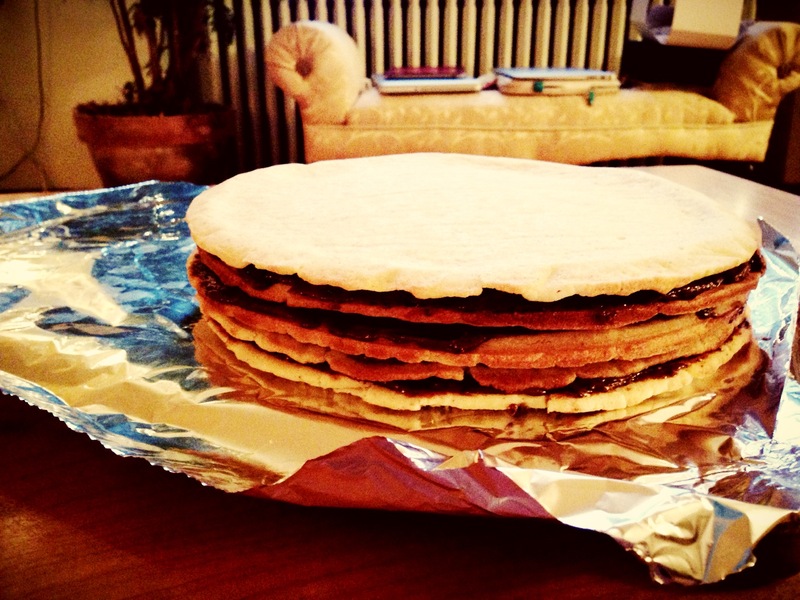 Assemble the cakes so that a smoother side is facing outwards on the top and bottom. Spread the jam to cover each cake completely before adding the next layer. When complete, wrap well in several layers of tin foil, place in an airtight container or bag and leave in a cool place to ripen for 3 weeks.